LA Photo: Defacto Prius Ads Invade SoCal Highways. Advertisements made of water loving non-native plants and flowers will be popping up along various L.A. public highways. The non-advertisement advertisements are part of a new marketing concept by Toyota to push the new 2010 ugly assed Prius on to L.A. drivers. The campaign designed by Saatchi and Saatchi is entitled "Harmony between man, nature and machine." In return for the prime space, Toyota will landscape a total of 3 acres around the square flowered uninspired ad. Mayor Antonio Villaraigosa along with Caltrans and Toyota officials help to launch and present the flower rectangle today at a press conference. 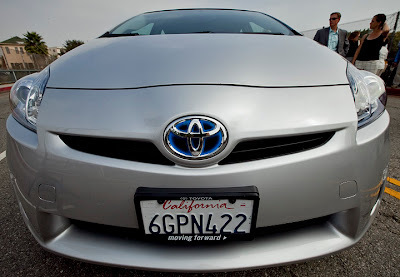 There will a be a total of 7 Prius ads around the public freeways of Los Angeles from this program. The first rectangle is at the Alpine overpass on the 110 freeway. Missing the supergraphics already. Wanna save the environment, ride a bike.